it would appear that I have tunnel vision for two things and two things only- brussels sprouts and kumquats. First, there was the hack recipe for a brussels sprout goat cheese flatbread. Then there were the kumquat margaritas. 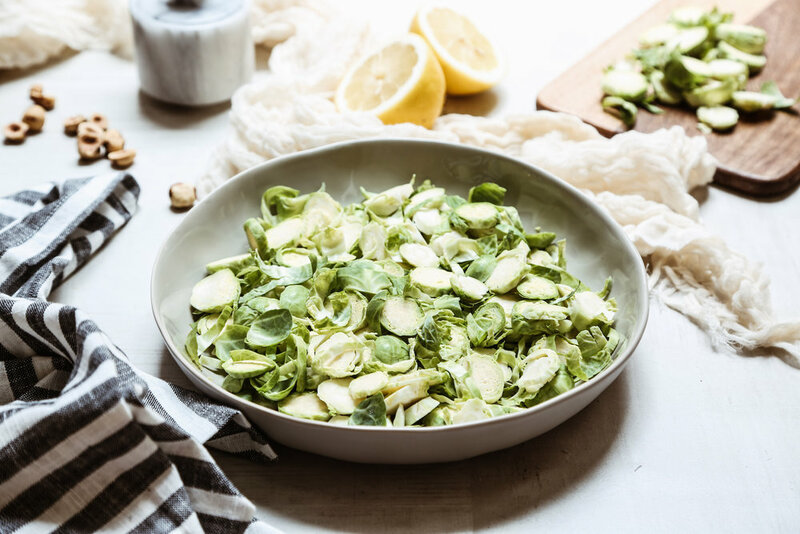 And now we're coming full circle with both ingredients joining forces in one recipe in this brussels sprouts AND kumquat salad. I know, I know. I can't hardly contain my excitement, either! I mean, both types of produce in one dish?! Like, I don't even know what to do with myself. And people say variety is the spice of life....Ha! I mean really, who needs variety to spice up their life when you can make an entire meal from basically two things? Flatbread, side salad, drink...done and done! But back to this salad real quick. 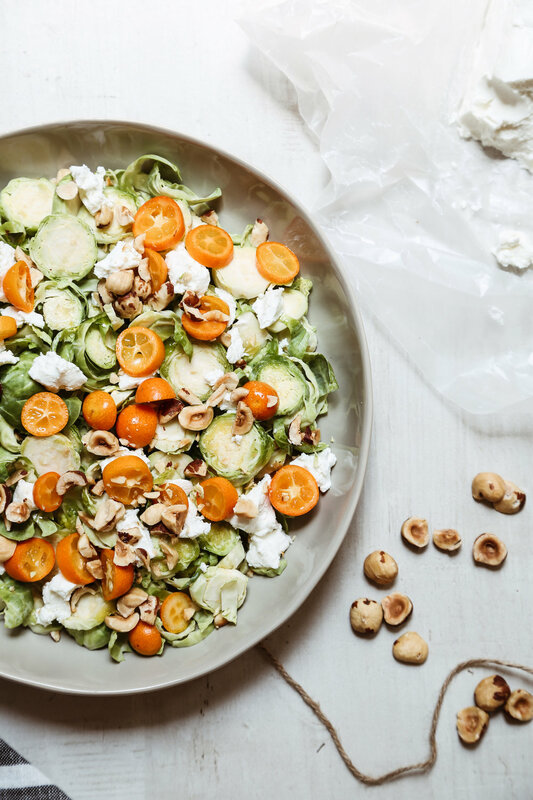 Like a lot of my recipes, this brussels sprouts and kumquat salad came about quite by accident. There were a few things in our refrigerator that needed to be used up (brussels sprouts, kumquats and goat cheese). 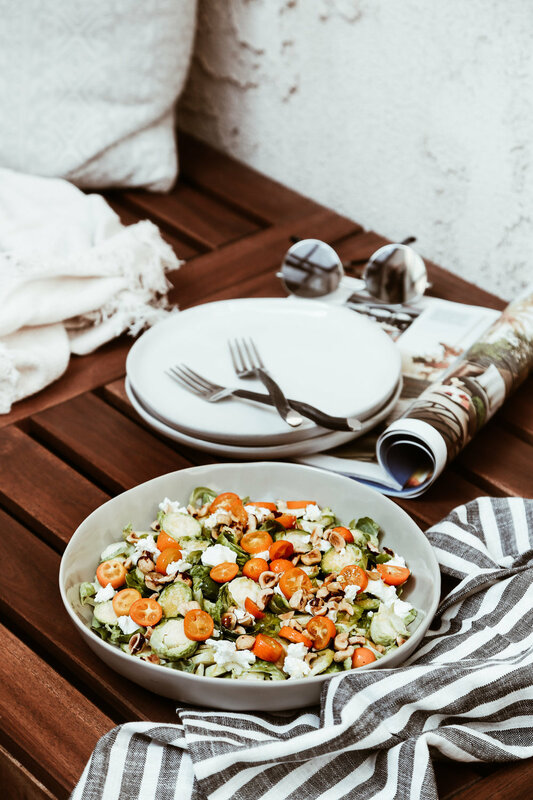 A little squeeze of lemon juice, a drizzle of olive oil and a toss of hazelnuts later, and we quickly realized we were digging into our new favorite salad. It hits all the right notes- crunchy, tangy, sweet, creamy, salty, fresh. It literally takes mere minutes to make. And, per usual, you only need a handful of ingredients. There's also no specific amounts of each ingredient required to makes this, so it's very adaptable whether you need to make a meal for one, or a side for 16 (but I do have some suggestions listed, in case you need guidelines). Try serving it along fish, enjoy it as a light lunch with a slice of grilled sourdough on the side, or pack it up for all the picnics and get togethers that are sure to come along this summer. Either way, it won't disappoint. Ok, so we've established that I can't stop cooking with brussels sprouts and kumquats as of late, but what about you. Is there anything you can't stop making or cooking with lately? 1. In a serving bowl layer brussels sprouts and kumquats. Sprinkle with desired amount of goat cheese crumbles and chopped hazelnuts. 2. To "dress" the salad, drizzle generously with olive oil, lots of fresh squeezed lemon juice and salt and pepper to taste. While this salad tastes the crispiest and freshest, served right away, it does keep 2-4 days, in an airtight container, in the refrigerator. Just skip mixing the hazelnuts into the whole salad (they'll get soggy in the leftovers), and sprinkle them only your serving.